Bagyong Yolanda has maintained its strength as it approaches the Calamian group of islands, state weather forecasters said. At 5pm today, the eye of Yolanda was spotted at 115 kilometers west of Roxas City or over the waters off the western coast of Antique with maximum sustained winds of 215 kilometers per hour near the center and gustiness of up to 250 kph. It is forecast to move West Northwest at 40 kph. Typhoon Yolanda is now traversing Sulu Sea and expected to cross Calamian Group of Island between 8-9 pm, then it will exit the Philippine landmass this evening towards the West Philippine Sea. 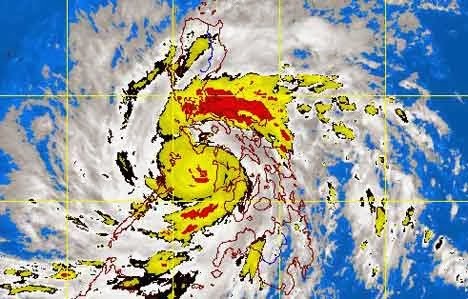 State weather forecasters said the estimated rainfall amount is from 10 to 20 millimeters per hour (heavy to intense) within the 400-km diameter out of the 600-km diameter of Yolanda. Sea travel is risky over the seaboards of Northern Luzon and over the eastern seaboard of Central Luzon, the weather agency warned. Residents in low lying and mountainous areas under signals 2 to 4 are alerted against possible flashfloods and landslides. Those living in coastal areas under the aforementioned signals are alerted against storm surges which may reach up to 7-meter wave height.